Please wait while the pictures load of each Russian Counterpart. The Patrol meets G.I. Joe resistance. 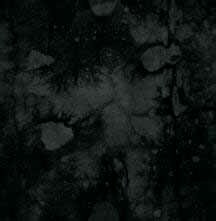 The two forces meet face to face. Full Title Page : The page has the words "Original Version" written in the left margin. It was written on a master copy because the ink color is the same as the art ink and the words do not bleed through to the back. However, the name " Mark" is hand written in blue pencil. This suggests it is a copy that was probably distributed during a meeting to review the book before publishing. Note the credits were not yet added in the bottom right corner. 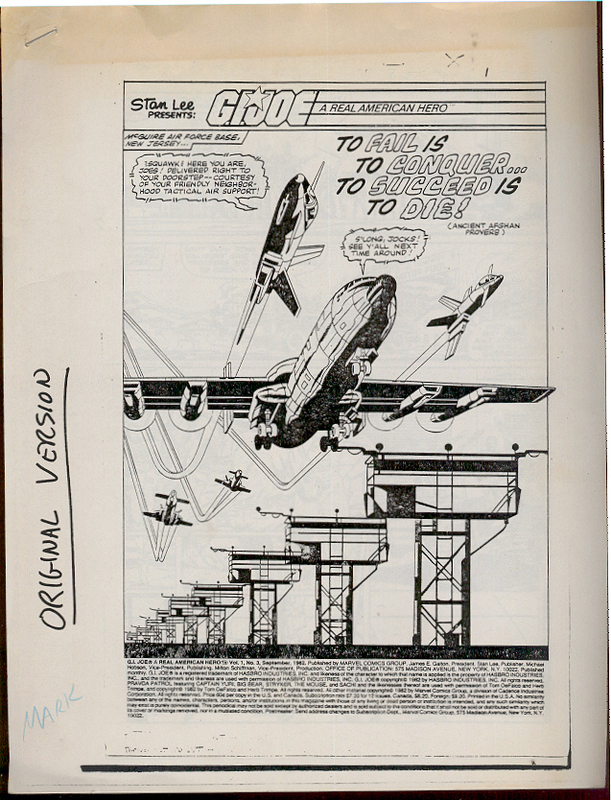 Disclaimer : The Disclaimer states issue #3 , however this issue was actually published three months later in issue #6. The Disclaimer does not match either issue #3 or #6. 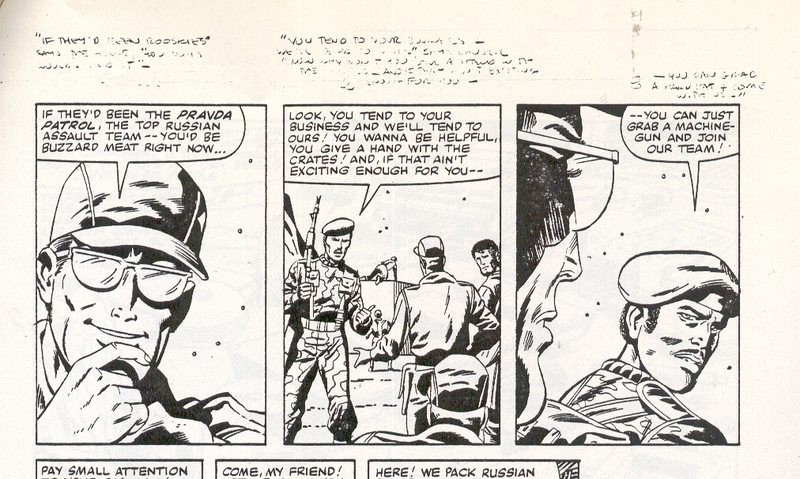 The most important line show in picture two reads, " PRAVDA PATROL featuring CAPTAIN YURI, BIG BEAR, STRYKER, THE MOUSE, and SACHI and the likeness thereof are used with permission of Tom DeFalco (Editor) and Herb Trimpe (Plot/Penciler), and copyright © 1982 by Tom DeFalco and Herb Trimpe." The unorganized release of comic issues would seen to explain why there is not a lot of continuity in the first 10 issues or so. They didn't really start making a serialized story until after the first year. Until that point most of them were just 1 shot stories. 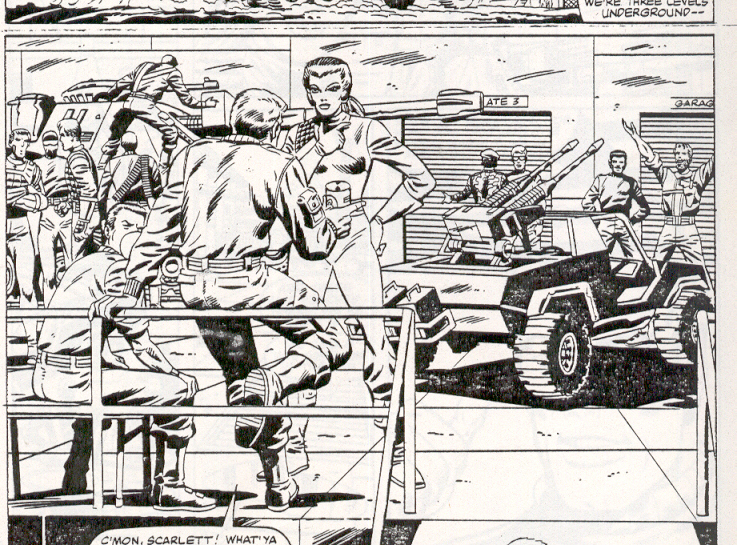 Approval : Hasbro probably did not authorize DeFalco or Trimpe to improvise on the characters they illustrated. Hasbro has shot down artist before using what is called a "Hasbro Licensing Approval Form". Licensed products would be checked by up to 5 different people to ensure the direction and quality of Hasbro Inc. Click on the image above to see what an official comic approval form looks like. This form was used for another G.I. Joe comic book. There are several demands expressed by the Hasbro legal team. 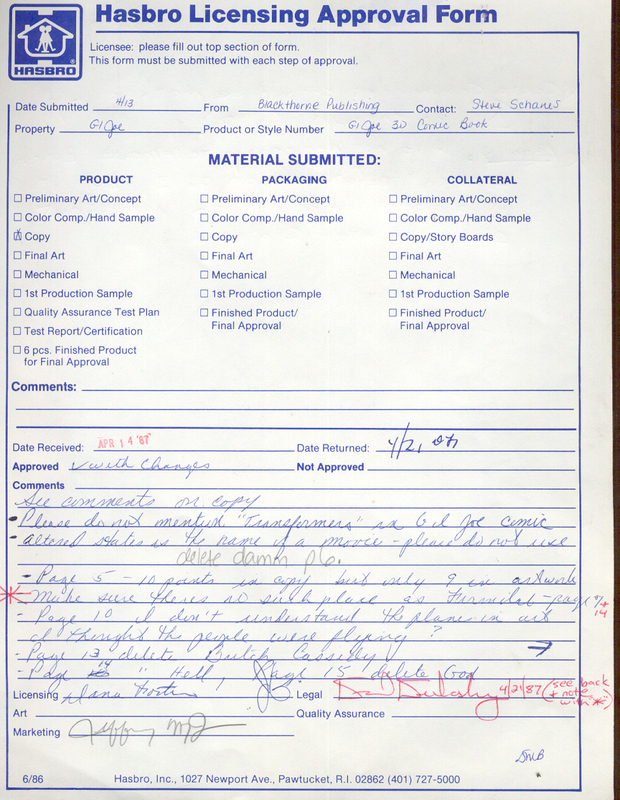 You can imagine DeFalco and Trimpe received several of these forms regarding changes that had to be made. Every piece of art involving the Pravda Patrol is different than the published Oktober Guard art version. This may explain why it took 3 more month to finally print this story. 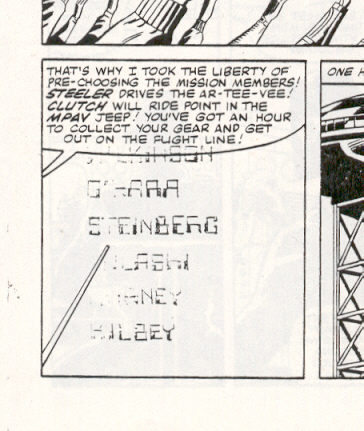 Missing Text : Page 2 has three missing text bubbles that carry a conversion between Steeler, Clutch, and Zap. Name Changes : The art originally showed the Joes last names, but was changed to emphasize there code name. Also note the vehicle name "MPAV Jeep" was corrected to read "VAMP Jeep". Generic Russian Reference : Notice the faded writing above and below most of the pages. These words read closely to the word bubbles, but they seldom read exactly the same. Perhaps this is the original script that has been modified to fit with the artwork. The last picture reads "Rooskies" written above in the margin. This may explain why DeFalco and Trimpe improvised the name Pravda Patrol since the name Rooskie is in slang for Russian. The history of the team's name has changed too. First the Pravda Patrol as named in the ashcan prototype. 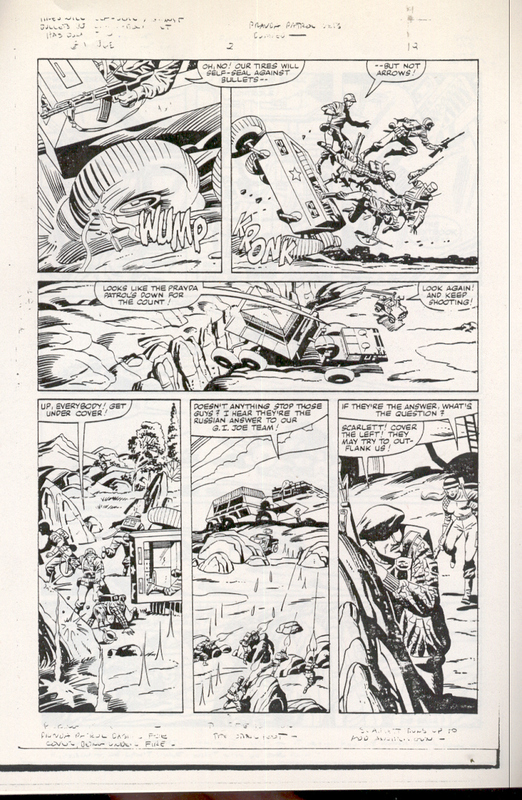 The first officially printed name was October Guard ( with a "c") in issues #6 and #7. Later it was changed again to Oktober Guard ( with a "k"). 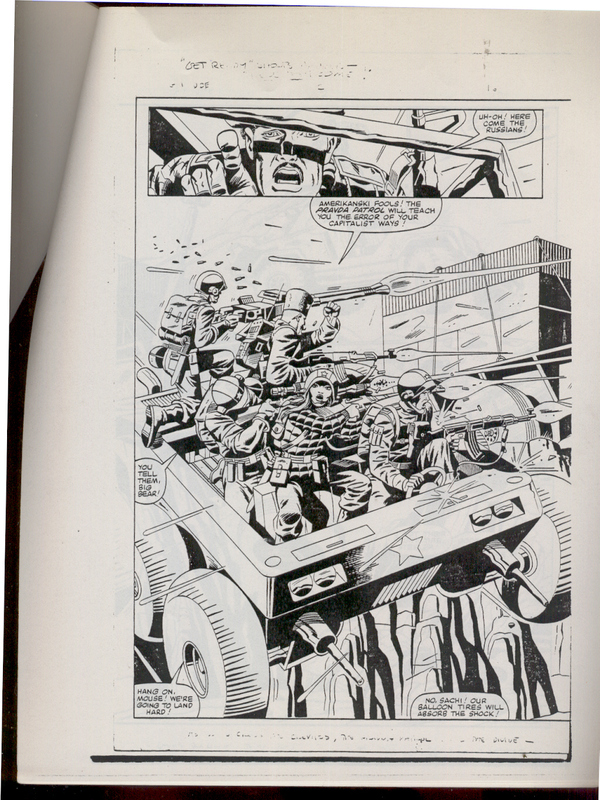 We asked Larry Hama, the man credited for writing virtually all of the comics and file cards. Larry is the main reason why G.I. Joe is so successful. He gave us some info on the Pravda Patrol and the story behind the names. The Pravda Patrol did have a limited appearance in Bizarre Adventures #31 ( April 1982 cover date ). Click Here to read a summary provided by Ronald Byrd and Jess Nevins. Special Thanks to Todd ( last name? ) and Roger Taft for doing the internet search to find this peice of information. Find out all there is to know about the Oktober Guard at their Headquarters. Any information you can offer to help uncover more history and the origin of the Oktober Guard / Pravda Patrol, it would be greatly appreciated! 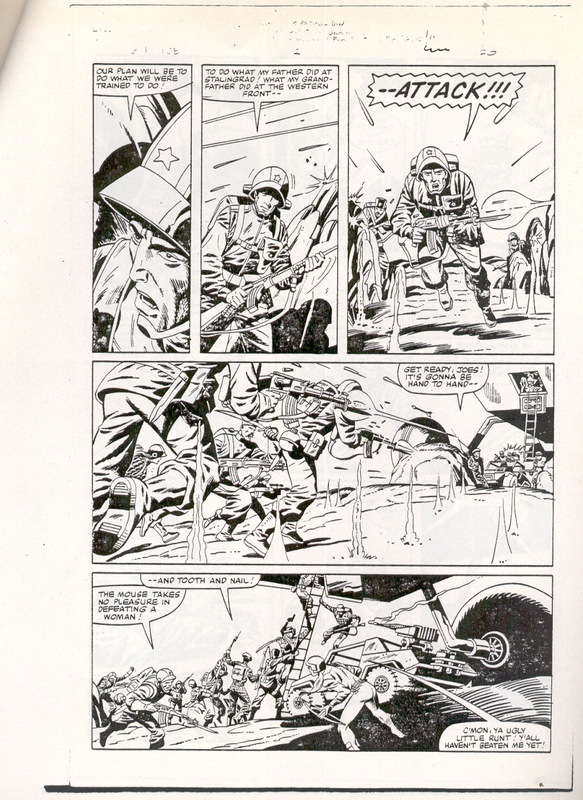 We especially need original comic art of the Oktober Guard from issues #6 and #7. Please contact Ron Conner @ snakeeye@gte.net or call 941-748-7644. Special thanks to Larry Hama (Marvel Comics), Dave Lane (Steel Brigade), Corey Stinson (Small Joes) and Roger Taft for lending their information on the history and origin of the Oktober Guard.